These vegetarian TVP or texturized vegetable protein veggie burgers are high in protein and are spiced up with a combination of ketchup to provide a bit of a meaty flavor, oregano, chili powder, and cayenne pepper to pack a bit of a kick. Feel free to omit the chili powder and cayenne if you prefer a milder veggie burger, or, experiment with adding a few other "meaty" sauces and spices: a bit of barbecue sauce, a touch of liquid smoke or some vegetarian Worcestershire sauce. Note that these TVP burgers are vegetarian, but since they do call for an egg as a binder, they are not vegan. TVP makes for a great vegetarian meat substitute as it is affordable (it's seriously cheap), high in protein, versatile and readily available. 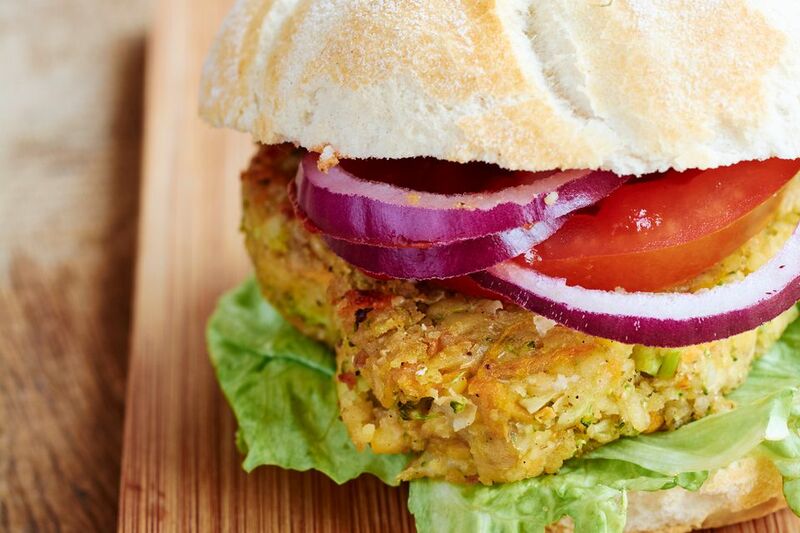 If you've never tried using TVP to make veggie burgers, try this recipe. I usually work with the TVP "flakes" which are about the size of your pinky fingernail and tend to be more readily available at most grocery stores, in my experience. The larger "chunks" won't work as well in this recipe. First, combine the TVP (textured vegetable protein) and the hot vegetable broth in a large bowl. Set aside to allow the TVP to rehydrate for at least 15 minutes, or until almost all of the vegetable broth liquid has been absorbed. Drain any excess moisture. Next, combine the rehydrated TVP with the remaining ingredients and stir to combine well. You may need to add a little more or less than 1 cup flour to get the mixture to the right sticky consistency. Form the mixture into patties and fry in oil over medium heat on each side until lightly browned, or, grill on a lightly greased barbecue or indoor grill. If you've struggled to make vegetarian (and especially vegan) veggie burgers in the past, you've probably had some trouble with veggie burger binders.